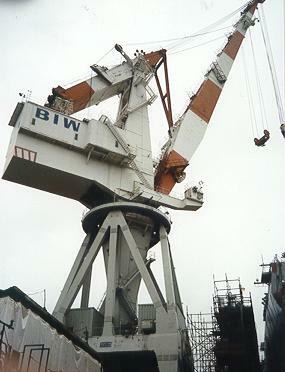 This is a complete list of all Bath Iron Works production, listed in order by BIW hull number. Small repair or overhaul jobs that were not assigned hull numbers are not included. The first column is the Bath Iron Works hull number, followed by the vessel's name, the type/size/class of the vessel, the owner/customer for the vessel, the type of work done (new construction, overhaul, etc. ), the date the vessel was delivered, and the fate or status of the vessel. For ships that remain in existence the current name is listed in the status/fate column; if no name is listed, the vessel retains its original name. For conversions, repairs, etc., the vessel's new name (at completion) is listed under "name", the original name and description are listed under "type", and the nature of the conversion is listed under "work type"; the date given is for redelivery or completion, as appropriate. Bath Iron Works, Ltd. collapsed in 1925. Its assets were sold at auction on 1 October 1925, and the shipyard was stripped. The yard was reopened in 1927 as Bath Iron Works Corporation. 158 Turecamo Girls 93' Harbor Tug Turecamo Towing Co. New 14 May 1933 In Service Rosa F.
Eskew, Garnett Laidlaw. Cradle of Ships. G.P. Putnam's Sons, New York, 1958. Snow, Ralph L. Bath Iron Works: The First Hundred Years. Anthoensen Press, Portland, 1987. List of Ships. Bath Iron Works Department 55, 1995. Special thanks to everyone who has provided updated information about these ships. Copyright © 1996-2000, Andrew Toppan. All Rights Reserved.